Which among the following is the features of Tietze syndrome? 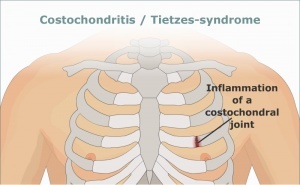 Tietze syndrome is a painful, nonsuppurative inflammation of the costochondral cartilages and is of unknown cause. Recent evidence suggests that costochondritis may represent a manifestation of seronegative rheumatic disease. Local swelling and tenderness are the only symptoms; they usually disappear without therapy.